Tune into Fox Sports for ASBK action, March and April! Fox Sports will broadcast jam-packed highlights of the Yamaha Motor Finance Australian Superbike Championship presented by Motul Pirelli (ASBK), with gripping footage of Round One Phillip Island Grand Prix Circuit and Round Two Wakefield Park Raceway. The ASBK is pushing for a significant mainstream television presence and the relationship with Fox Sports is key to that vision. With near capacity grids in all ASBK classes, multiple manufacturers from around the globe and riders duking it out for supremacy, the ASBK Championship is more dramatic and arresting than ever before! Now the fans have a range of ways to view the Championship and catch up on all the action; including on Fox Sports. Fox Sports’ coverage of the ASBK will showcase breathtaking "all on the line" racing across multiple categories of the Championship. Featuring interviews with riders, insights from the teams and in depth commentary from Steve Martin, Phil Harlum and Emma Notarfrancesco. The Fox Sports package will bring all home viewers closer to the action than they ever thought possible. 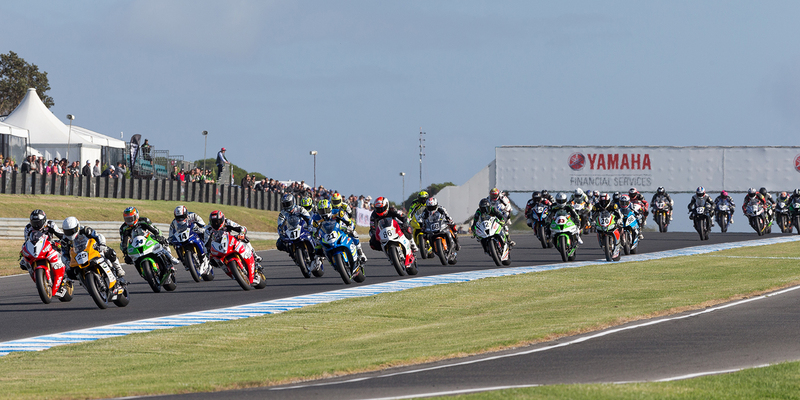 Don't miss the action from Round One Phillip Island Grand Prix Circuit, replayed on March 23, 25 and 28. Be sure to watch, Round Two Wakefield Park Raceway, replayed on April 5, 7 and 11. The schedule for the Fox Sports airing times, are as follows. Fox Sports Air Dates and Times. 2017 has already been a year to remember with two incredible rounds, that showcased riders from all categories going all out for the title of Champion. Don’t miss out on the opportunity to relive the action! So be sure to tune in to Fox Sports to get your motorcycle racing fix! Race 1 saw Wayne lead in the early part of race, but having wet tyres on a dry track meant that all he could manage was a creditable 8th position. In race 2 Wayne wins after a red flag ended proceedings, whilst Wayne was passed just prior to the red flag the race was taken back one lap. Wayne finished 2nd overall for the round and moved up to 4th in the Championship. 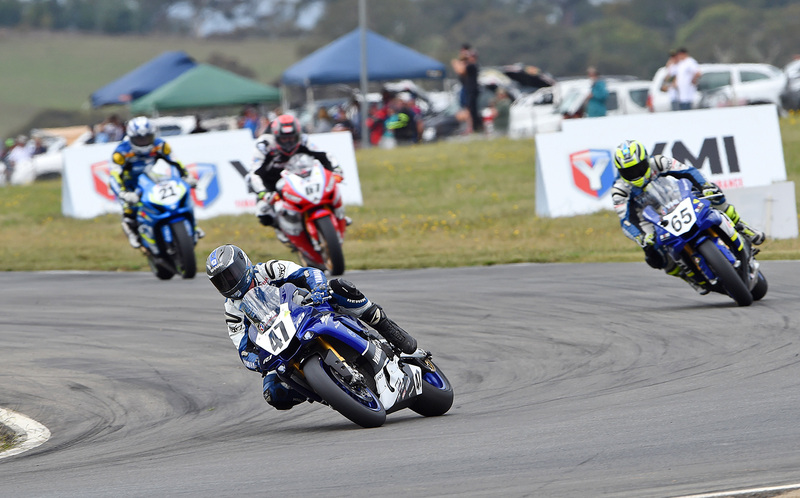 It was a weekend of triumph and tragedy for the Yamaha Racing Team as they contested round two of the Australian Superbike Championship at Goulburn’s Wakefield park, over the weekend. The weekend started off on a sour note when Glenn Allerton crashed early on in practice leaving him with a broken arm. Allerton high sided at turn 10 and was then taken to Hospital where it was determined he had broken his arm in two places and required immediate surgery. Allerton’s doctors are predicting that he will be out of action from eight to ten weeks, which means he will miss the next round of the championship. However, if everything goes well the three times Australian Superbike champion should be back for round four, which will take place at Darwin’s Hidden Valley Raceway, which will take place on the first weekend of July. “I just don’t know where I really stand at the moment as the injuries are so fresh. I just have to give myself some time to heal and then see what is actually going on with my arm. If my arm is good and I feel strong on the bike when I do some practicing at Sydney Motorsport Park, then I’ll go to Darwin,” Allerton ends. In contrast to Allerton’s weekend, Wayne Maxwell was able to keep his championship hopes alive after taking home second place for the round with 8-1 results. With unpredictable weather all weekend as showers came and went throughout, riders and teams were taking educated guesses for the right tyre set up for race one. When Maxwell left pit exit for the sighting lap the track was partly wet, which saw the 2013 Australian Superbike champion leave on wet tyres. However once the red lights went out for the twenty lap race the track dried out completely. Maxwell led for the opening two laps, but later slipped down the running order due to racing on wet tyres. Maxwell picked up a respectful eighth position, scoring 13 championship points. “In race one you were in control of the Gods,” said a happy Maxwell said. “It could have rained and I could have been a hero, but it didn’t. Unfortunately, that’s the way it goes. In race two, Maxwell again got a good start and managed to capitalize on it. He went about just settling into a rhythm and led the race but soon came under pressure from Cru Halliday. It then became a three rider battle when Troy Herfoss joined the lead group but just as things were reaching a climax, Halliday went down hard and the red flag was bought out. With Maxwell leading the last completed lap before the red flag, he was awarded the race win and managed to claw his way to second place for the round and now sits fourth in the championship. “The guys at Yamaha Racing Team gave me a fantastic Yamaha YZF-R1M this weekend, considering our lead up has been a bit hectic. But credit to everyone on the team who has worked so hard to get things back on track for us and hopefully this is the start of our championship climb. “On top of that it was tough conditions this weekend with rain coming and going every five minutes just made it that much harder for everyone but we made it to the podium and it’s a nice little reward for the team. “We are going to take the positives from this weekend and move onto Winton, Maxwell concluded. Round three of the championship moves to Winton Raceway in Victoria, a track that Maxwell as done well at in the past. With Allerton on the sidelines, there is no official decision on if a guest ride will be on offer as the team will get a full assessment of Glenn’s injury before making any decisions. Reflecting on the weekend, Team Manager John Redding said; “It has been an up and down weekend for the entire team. Glenn’s crash has certainly hit the team pretty hard, as we only had one rider in Wayne for the round. Race two we got some luck due to the red flag and that’s the way racing works some times. We managed to tighten the points up a bit and we just have to keep chipping away at each round and make inroads into the deficit we found ourselves in after Phillip Island,” Redding ends. Yamaha Racing Team will head to Winton Motor Raceway on the 11-12 April for an official ASBK test, before returning to the 3.0km circuit just outside of Benalla on the last weekend of April for round three of the championship. Watch all the live Australian Superbike Action here in 2017. ASBK 2017 Goes Live from Round 2! In one of the most important announcements for 2017 and for Australian motorcycle road racing in recent years, the Yamaha Motor Finance Australian Superbike Championship (ASBK) will now feature Live on free-to-air television via SBS. In addition to cementing the two-hour Live TV broadcast, the ASBK championship will also be live streamed and available on demand, while retaining its delayed telecast through long term partner Fox Sport Australia. The new live broadcast package will take place from round two, due to be held at Wakefield Park Raceway on March 19, while round one, held at the Phillip Island WSBK, February 23-26 will feature as a delayed telecast on Fox Sport and SBS. The ASBK is extremely excited to welcome on board AVE as the TV production partner ahead of the huge 2017 race season. AVE have fulfilled the long overdue desire for the ASBK to be aired live on multiple platforms and to reach a broader national and international audience. SBS Head of Sport, Ken Shipp stated, “We are thrilled to be part of the evolution of the Yamaha Motor Finance Australian Superbike Championship, and provide live viewing opportunities to our audience of a very exciting sport. The ASBK has come along in leaps and bounds and live TV was the obvious and necessary step for the sport to continue its forward momentum. SBS is proud to be part of this important milestone. “SBS has long been a great supporter of motorsports both domestically and internationally. SBS has worked with AVE in the past and we can’t wait to assist in the growth of the ASBK by providing an accessible platform.” Shipp finished. 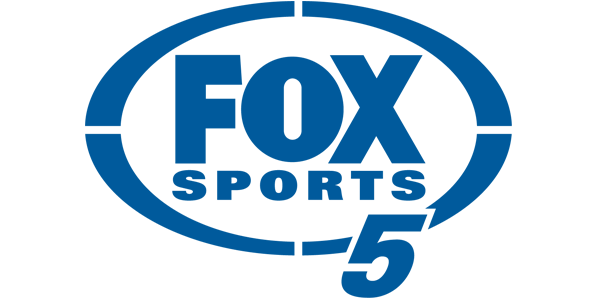 The ASBK also welcomes back Fox Sports, now in its third consecutive year of partnership and have been instrumental in adding to the success of the championship, boasting a very large audience base nationally. 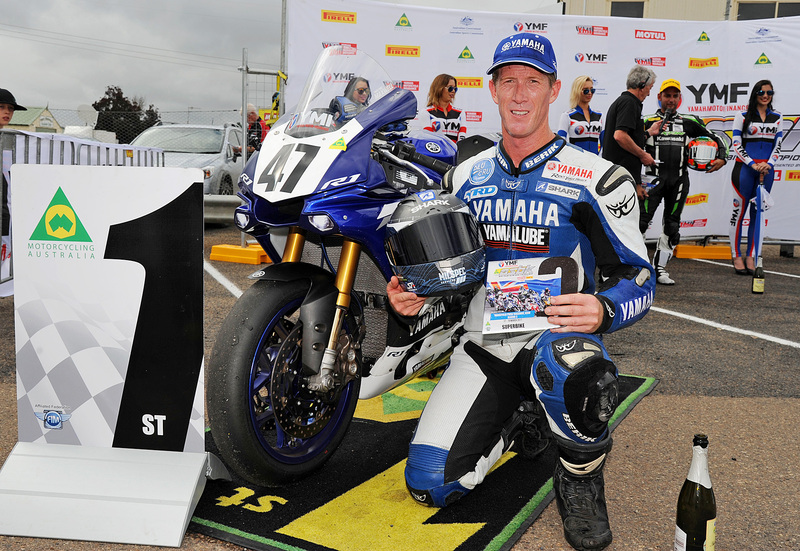 Motorcycling Australia’s CEO, Peter Doyle added; “The Yamaha Motor Finance Australian Superbike Championship has gone from strength to strength in the past couple of years as the popularity of the ASBK now shows. Over a long period, we have all worked hard together to shape the ASBK into what we all envisaged it could be. “We have seen encouraging sponsorship commitments, incredible factory and team support, as well as overwhelming volunteer support for the ASBK. The opportunity to showcase our strong talent pool by televising the ASBK via Live Steam and free to air has come from the outcry of fans everywhere. This is just another indicator of how much interest there is domestically and internationally in the ASBK.” Doyle concluded.